Boulder Dash is back digging, crushing, and grabbing diamonds. You play Rockford who in the original 1984 version was just a guy trying to grab some diamonds while dodging fireflies and killing butterflies. Now Rockford is a robot with a telescoping arm and has a host of new enemies, maps, and devices. The first few levels are very easy but just about the time you start getting cocky things get deadly fast. You're racing against the clock trying to collect as many diamonds as you possibly can so you can open up the next exit. The real danger is getting greedy, thinking you have time to grab just one more diamond, that you can reach another one despite the danger. 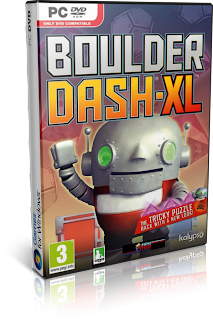 The most difficult part of Boulder Dash is you and that is what makes this game so fun, the urge to smarter to problem solve faster is at the core of what has always made this game great. The best thing about Boulder Dash XL though is the original 8 bit version that comes with it, which honestly I enjoy playing more than the HD version. It was one of my favorite games on the Commodore 64 and it has a certain intensity that the HD version just can't capture. 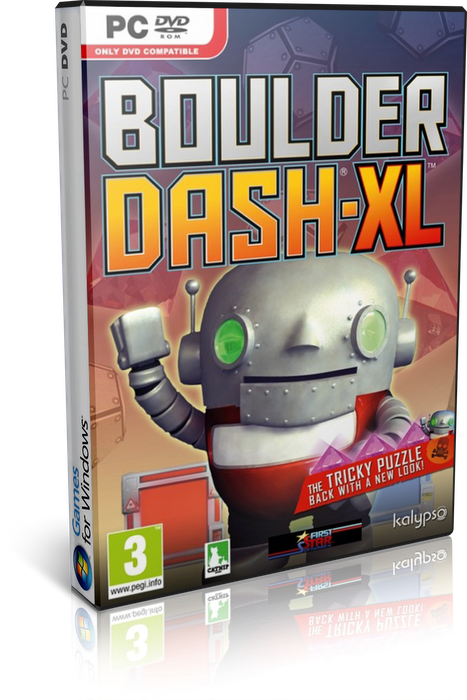 The original mechanics of Boulder Dash still hold up, the game is fun, fast paced, and requires a great deal of skill. We give Boulder Dash 8 stars out of 10. 2013 All Rights Reserved Free Video Games - Game Giveaways | Xbox 360 Playstation 3 Nintendo Wii Consoles.